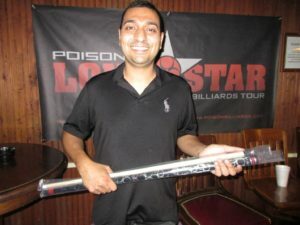 Burak Temel went undefeated in the 57-player, amateur 9-ball division, to win his first, Poison Lone Star Billiards Tour title. Temel overcame Bob Guzik, aka “The Pittsburgh Flash”, 5-0, in the first set of true, double elimination final. In the 49-player, open 9-ball division, Ernesto Bayaua overcame Charlie “Hillbilly” Bryant, 7-3, booking his fifth win at home, and securing his second, Tour Championship in his division. Chad Reece of Lufkin, Texas, took home his first Tour Championship in the amateur 9-ball division. Most improved players in each division will be announced following the final event, October 27th-28th, at CK Billiards in Dallas, TX. 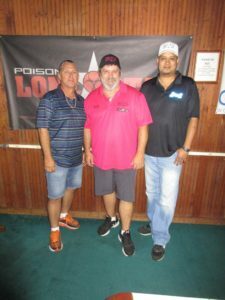 On October 13th-14th, 2019, Tour title sponsor, Poison by Predator Cues, and sponsors Cyclop Pool Balls, APA of North Harris County, Vapor Knights U.S.A. and Outsville Billiards, facilitated a successful tour stop that paid out $5,985 to Poison Lone Star Billiards Tour players. Mark your calendars! The first two events of the 2019 season are slated for January 5th-6th and February 9th-10th, in Houston, Texas. The full schedule will be up soon, at www.LoneStarBilliardsTour.com. In the amateur 9-ball division, making his way to the winners’ side final four, “The Pittsburgh Flash”, Bob Guzik, tagged Lance Zerger, Chad Reece, 5-1, Hector Torres, 5-4, and young gun, Joey Bourgeois, Jr., 5-4. John Lassek defeated Jesus Cortez, Jr., Victor “Champion” Rojas, 5-1, Seth Gonzales, 5-3, and Ernesto Gonzalez, 5-1. Also on his way to the final four, Burak Temel ousted Shane Thompson, San Antonio’s David Gonzalez, 5-2, Sonny Bosshamer, 5-2, and Kevin Frauenberger, 5-1, while Bobby Perez ran through Richard Stuart, Eric Molina, 5-4, Doug Gray, 5-3, and J.C. Torres, 5-1. On the one loss side and in the money, Eric Cantrell eliminated Molina, 5-0, but fell to Frauenberger, 5-2. Ricky Hughes dusted off Richard Hernandez,5-3, and J.C. Torres, 5-1, while Will Felder sent home Rojas, 5-3, and Joey Bourgeois, Jr., 5-3. Rounding out the final eight, Reece overwhelmed Michael Parrott, 5-0, and Gonzalez, 5-0. Back on the east side, Guzik slid by Lassek, 5-4, and Temel took down Perez, 5-2. In the hot seat match, Temel was down 4-1, and came back to win, 5-4. On the west side, Frauenberger overcame Hughes, 5-4, but fell to Lassek, 5-0. Felder took out Reece, 5-3, along with Perez, but fell to Lassek, 5-4. Lassek was ousted by Guzik, 5-2, timeearning himself another shot at Temel. 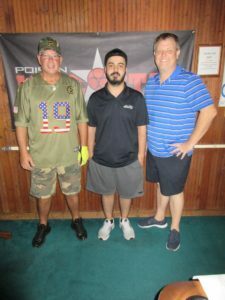 In the finals, Temel wasted little with Guzik, finishing him off, 5-0, to win his first-ever, Poison Lone Star Tour title. In the open 9-ball division, Ruben Bautista made his way to the winners’ side final four, booking wins over Will Felder, Seth Gonzales, 7-5, David Chow, 7-0, and Shane Thompson, 7-5. Ernesto Bayaua sliced through Leesville’s Colton Berzins, 7-3, Victor Rojas, 7-5, and John Lassek, 7-3. Charlie “Hillbilly” Bryant took down Chad Reece, 7-1, Kevin Frauenberger, 7-3, and Houston’s Blaine Barcus, 7-3. Joey Bourgeois, Jr., rounded out the final four, with wins over Karol Hughes, Eric Cantrell, 7-3, Ricky Hughes, 7-3, and Andy Jethwa, 7-1. On the one loss side, and in the money, Rojas eliminated Sonny Bosshamer, 7-4, but fell to Barcus, 7-3, while Joey Torres took out Reece, 7-6, and Jethwa, 7-4. Rounding out the final four on the one loss side, Hughes sent home J.C. Torres, 7-6, and Thompson, 7-3, while Bobby Perez denied Frauenberger, 7-5, and Lassek. Back on the east side, Bayaua stopped Bautista, 7-4, while Bryant slid past Bourgeois, Jr., 7-5. The hot seat match witnessed Bayaua overwhelm Bryant, 7-3. Making their way through the one loss side, J. Torres logged his sixth win, defeating Barcus, 7-3, then Bautista, 7-6. Hughes finished off Perez, 7-1, and Bourgeois, Jr., 7-2, but fell to J. Torres, 7-5. J. Torres ran into a brick wall with Bryant, suffering a four-pack special which spiraled into a 7-0 loss. Bryant earned a rematch with Bayaua, but the story was much the same. Bayaua ended Bryant, 7-2, marking his fifth win at home, and taking home his second, Poison Lone Star Billiards Tour Championship! Congratulations are also in order for Chad Reece, who took home his first-ever, Tour Championship, in the amateur 9-ball division! The Tour would like to extend its deepest gratitude to all the new and resident players who attended this event, and those who donated boxes and bags of white rice. 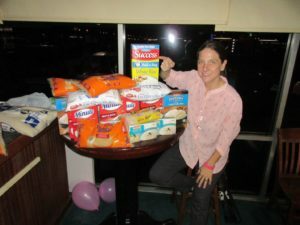 The Tour collected nearly 100 lbs of white rice, for its “Players for Pooches” program, benefitting the sickly dogs of Montgomery County shelters. Congratulations to David Gonzales, who took home a new, Poison Cyanide playing cue, in the weekend raffle. Join us for our final 9-ball event of the season, October 27th-28th, at CK Billiards in Dallas, Texas. Mark your calendars! The first two events of our 2019 season are slated for January 5th-6th and February 9th-10th, in Houston, Texas. The full schedule will be up soon, at www.LoneStarBilliardsTour.com.